If you reload your own ammo then you understand the satisfaction associated with finding that perfect combination of bullet, powder, primer and case that will deliver extreme accuracy in a particular gun. It is also, for some, a very relaxing process where you can unwind from all the hustle and bustle of everyday life. But at times it also can be frustrating and get expensive especially to someone who is a beginner. There is a lot, and I mean a lot, of information that has to be learned and digested if it is to be done safely and accurately. Even long time reloaders have to be always extremely attentive to what they are doing in the reloading process. I have been reloading ammo for various calibers for 15 or so years. I've read tons of how-to magazine articles and entire books as well as reading reloading threads online. Before I go too much further, let me add that if you are interested in getting into reloading or if you are a "seasoned reloader," never depend on someone else's reloading data. Use the many reloading manuals available as your guide in working up loads that you are going to use in your particular gun. If you do choose to use an unpublished load formula from the internet or a friend or even a magazine article, do so in a safe manner by starting off with lower powder charges. What someone else uses in their gun may not be safe in yours. So this brings me to why I am writing this article. Even a long time reloader like myself is prone to mistakes. As I stated, I reload for several calibers but want to talk about reloading for the .40 Smith and Wesson (S&W). Now this is an extremely popular caliber today and used by many in competition shooting and even law enforcement. It is a safe caliber to reload for as long as you understand some things associated with this caliber. I own and use a Glock 35 which is chambered for the .40 S&W caliber. Glock pistols have a reputation for extreme reliability. This is what attracts me to them. They are at the top of the list for self-defense pistols. But as with many things, you have your loyalists for certain guns and that leads people to either hate them or love them. I am of the latter group. When I first decided to reload for my Glock 35, I had to go out and purchase reloading dies. I use a Dillon 550B to load all of the handgun calibers as well as a couple of rifle calibers. In my opinion, there is none better than Dillon reloading equipment for reloading pistol calibers. 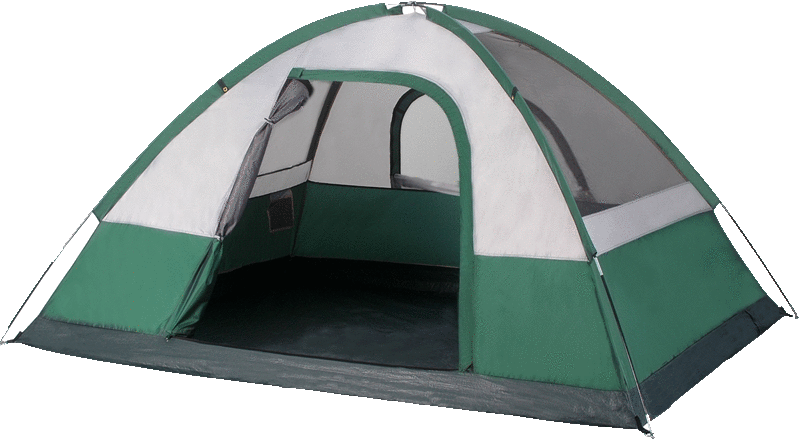 Since the Dillon company is located here outside of Phoenix, AZ in Scottsdale, I have the luxury of going directly to their factory location. When I told the clerk I needed some .40 S&W dies, he asked me if I was using a stock Glock barrel or an aftermarket one. I told him I was using the barrel that came with the gun. That's when he informed me of the problems that the .40 S&W caliber Glocks were having if you were using brass that had been fired from the factory barrels and once reloaded. They could cause failure to chamber or even an explosion. He explained to me that the chamber of the factory barrel did not fully support the whole length of the case when fired and that it could cause small, sometimes unseen bulges down towards the case head. This would cause difficulty in a reloaded round not chambering properly. So my reloading went well and I experienced no problems until one night last year while participating in one of our club's practical pistol events. When it was my turn to shoot the steel course of fire, on my third round I experienced what many refer to as the "Glock Kaboom." The breech end of my barrel had exploded and came up partially thru the slide's ejection port. I felt a sting in my shooting hand and immediately froze. While looking at the top of the slide and keeping the gun muzzle pointed downrange, I surveyed the damage. Racing thru my mind was that I must have had a reloaded round that did not get resized properly and that a bulged case had caused this kaboom. Our shooting range official, Bill, who just happened to also be timing me gave me the command to cease fire (not that I would have been able to fire another round anyway) and to wait a minute before trying to clear the gun or even inspect it. After a minute or so, I pushed the magazine release button and the mag came out with some additional pulling to assist it. I then proceeded to a designated safe area. I was accompanied by Wade who is our club's Glock "guru." We could visually see that the bullet had exited the barrel from the defective round. But the barrel itself had split in two places halfway down its length and up thru the slide ejection port with a shattered brass casing still stuck in the barrel's breech end. Let me add here that the sting I felt when this happened was not from any shrapnel, but from the hot gas pressure of the blast itself. My hand was not injured in any way, burned or cut. I was extremely lucky as this could have been very disastrous. I also was wearing the proper eye and ear protection which is mandatory for our club events as well as the range we were at. In looking at the damage to my Glock, I thought it was completely trashed. But after looking closer it seemed that the damage had been restricted to the slide and barrel, not the lower. One big problem was that because the breech end of the barrel was partially sticking up thru the slide ejection port, I wasn't able to separate the slide from the lower. 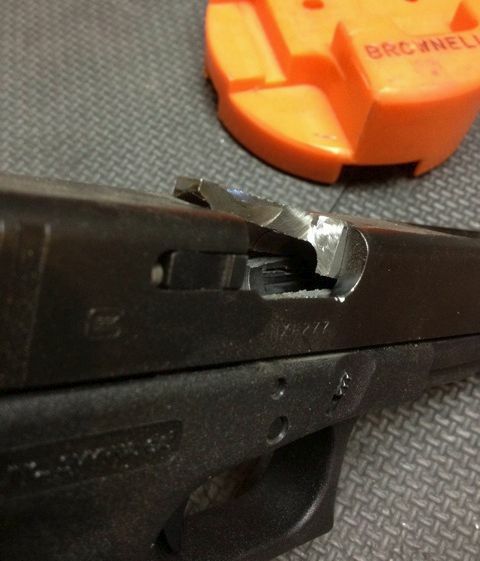 The next day I took the gun to a local Glock armorer to see if they could remove the slide from the lower. They tried, but couldn't. So when I returned back home, I sat down on my work bench and stared at my poor Glock for several minutes trying to think how I could get the slide and barrel off and still save the lower (if it had even survived the explosion). I could replace those two parts easily enough. So I decided that I would get out my Dremel and start cutting the slide away carefully piece by piece hoping not to do any damage to the lower. I started cutting away at the exposed barrel portions first, still hoping to loosen the slide up enough to get it separated from the exploded barrel. The brass case came out easily using just a pair of needle nose pliers. Then I worked on cutting out little pieces of the barrel carefully. As I removed little pieces of the barrel, each time the slide would move a little more. Finally with some more cutting, banging and punching, it broke free. Much to my pleasure, the lower showed no damage. And to my further joy, with careful hammering around the slide's ejection port I was able to reshape it where it looked like a replacement barrel might work in it. I still had the original factory Glock barrel for it, so I installed it in the slide and it functioned perfectly. A few days later, I was able to make a trip to the desert for a test firing (using factory ammo). At first, I did slow firing. So far, so good. Next I loaded up a 15 rounder and emptied it as quick as I could. 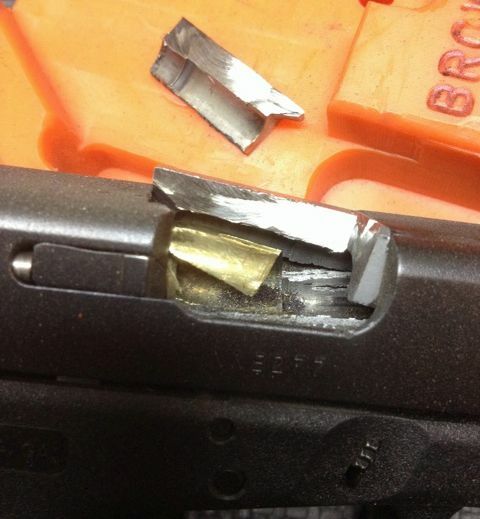 15 trigger pulls, 15 rounds exited, and the slide locked back as normal when the mag emptied. Was I lucky or what? During this whole ordeal, I couldn't figure out the exact cause of what actually made this happen. At first I thought that somehow the reloaded case may have had a bulge but I ruled that out for two reasons. Firstly, this is the only .40 S&W handgun I have and it had a better supported aftermarket barrel installed so no bulges in cases should have occurred. Second, I check each and every round I reload either in the barrel chamber itself or with a case gauge. Did I miss one? Not likely, but possible I suppose. My belief is that during the reloading process I may have missed a split case during my inspection of it. Or possibly somehow over charged the powder load. I tend to not think the latter happened. I think a double charge would have done much more damage to the gun as well as possibly serious injury to me or others. So, I guess the point of all this is that if you reload or plan to reload sometime in the future, you need to be informed, vigilant, knowledgeable, and careful. Do not be afraid or discouraged or even intimidated in reloading ammunition. It can be enjoyable, rewarding and cost effective. As a side note, this Glock 35 is now my designated home defense handgun. Even though it has functioned flawlessly and safely, I have chosen to replace the slide and barrel and practice with it using reloads. My Glock now rocks safely again.